This pair of images shows a before-and-after comparison of the area on comet Tempel 1 targeted by an impactor from NASA's Deep Impact spacecraft in July 2005. 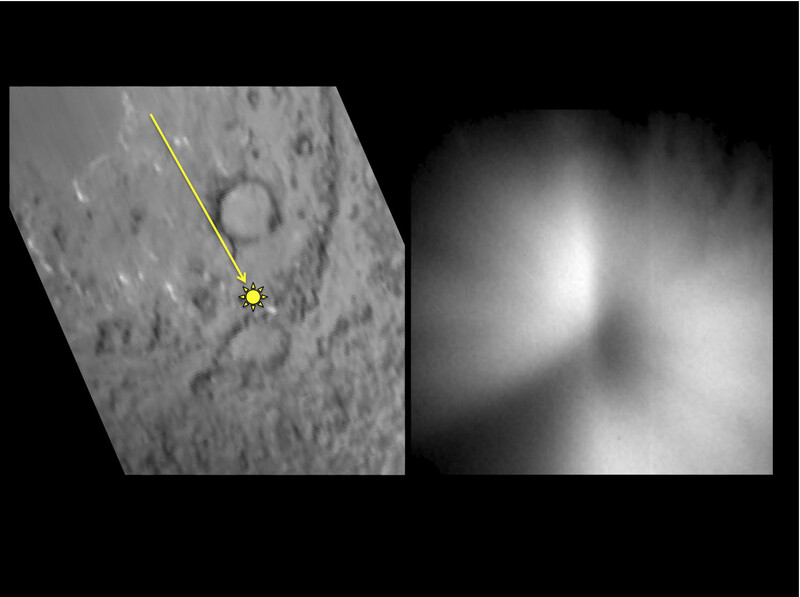 The left-hand image is one of the last obtained of the Tempel 1 surface by the impactor's high resolution imager before the impactor hit the surface. An arrow shows the direction the impactor traveled toward the surface, with a yellow spot that shows the impact target. The right-hand image shows the plume of material kicked up by the impact that obscures the surface. It was obtained about 700 seconds after the impact. The University of Maryland was responsible for overall Deep Impact mission science, and project management is handled by NASA's Jet Propulsion Laboratory, Pasadena, Calif. The spacecraft was built for NASA by Ball Aerospace & Technologies Corporation, Boulder, Colo. JPL is a division of the California Institute of Technology, Pasadena.